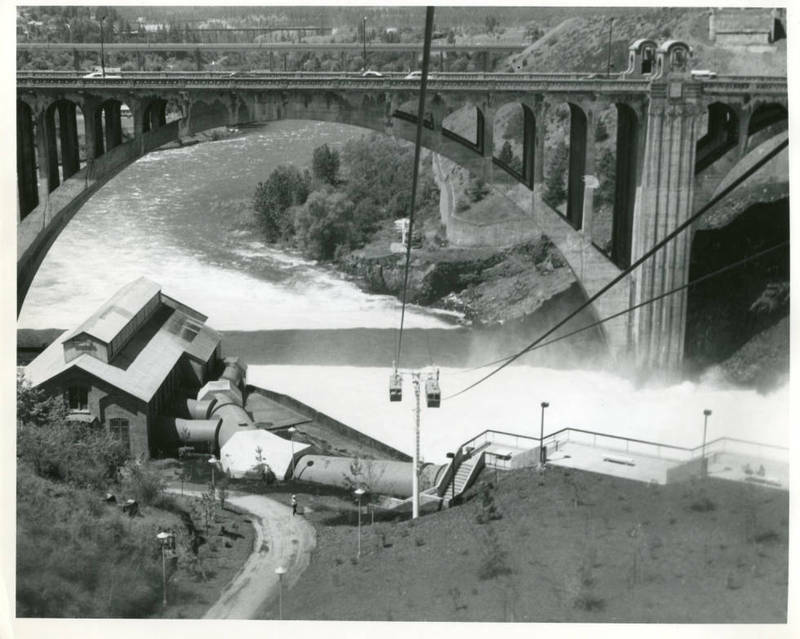 The 1974 World's Fair provided Spokane with an opportunity to reclaim the beauty of Spokane Falls, which had been hidden for years by railroad tracks. In order to provide visitors with the most stunning views of this natural feature, fair planners built the SkyRide. 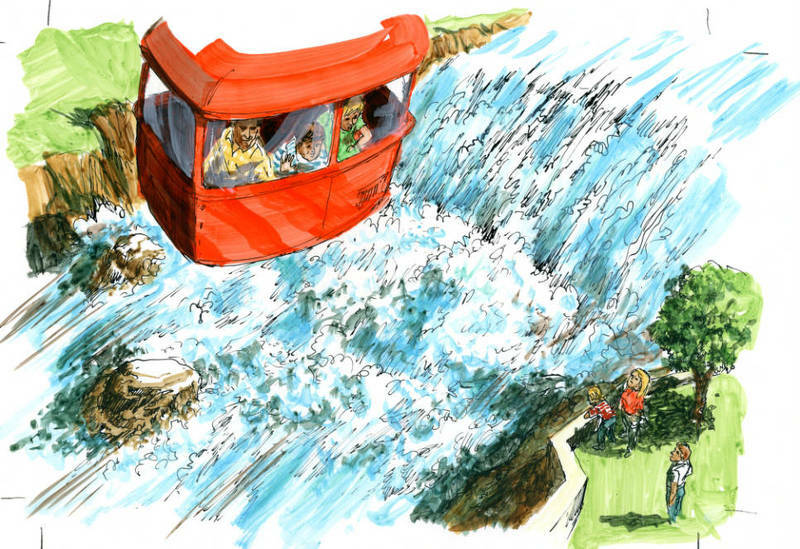 This attraction would provide visitors with unparalleled close ups of the falls for years to come. 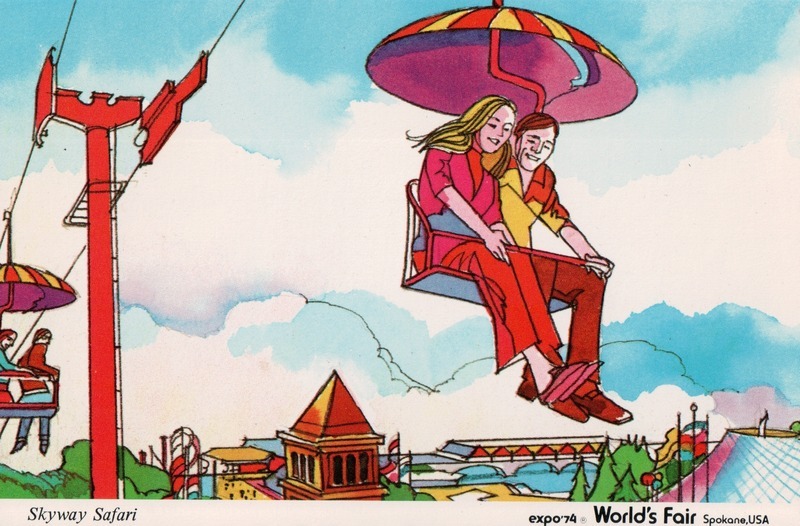 There were two different sky rides featured at Expo, one over the fair, and the other over the falls. The ride that went over the fair was simply a ski lift minus the snow. 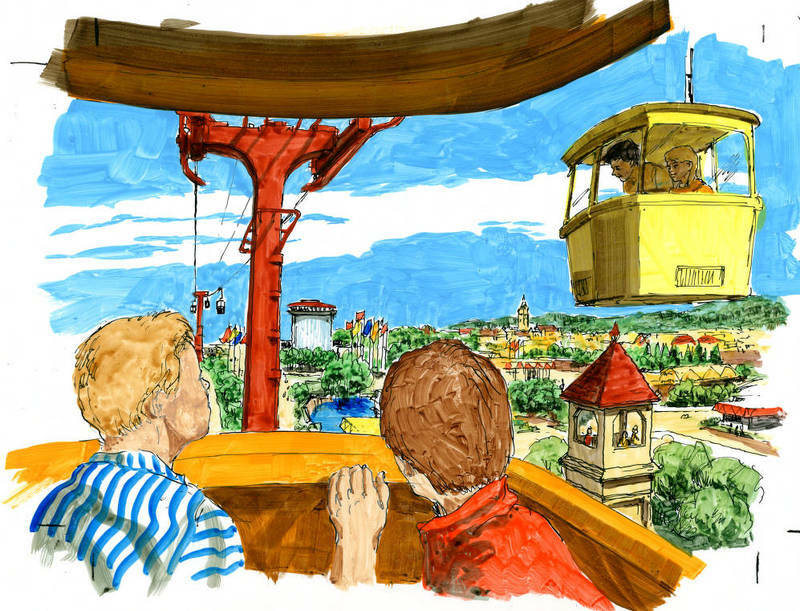 Visitors would hop on the lift and experience the fair from a whole new perspective. Riding the chairlift provided a bird's eye view of many of the pavilions and perhaps helped fairgoers plan their day in terms of figuring out what to go see first. 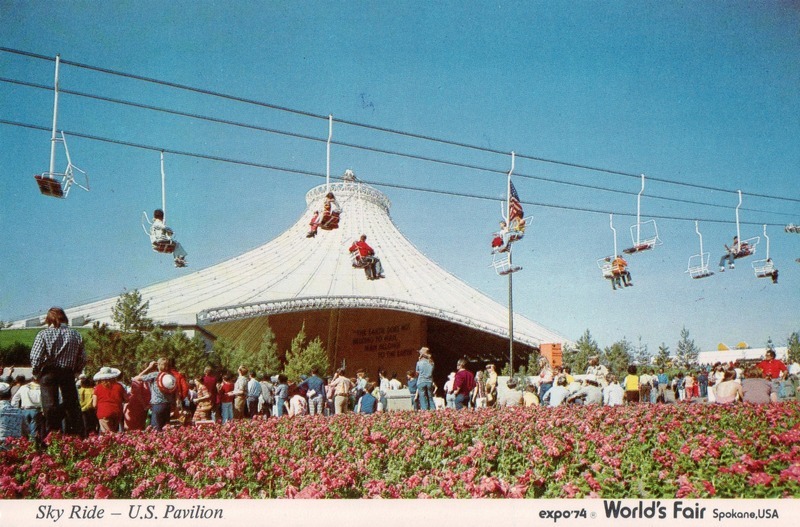 Like most structures built for Expo, the chair lift was removed from the park when the fair ended. The second ride runs directly over the falls and serves to this day as one of downtown Spokane's main attractions. 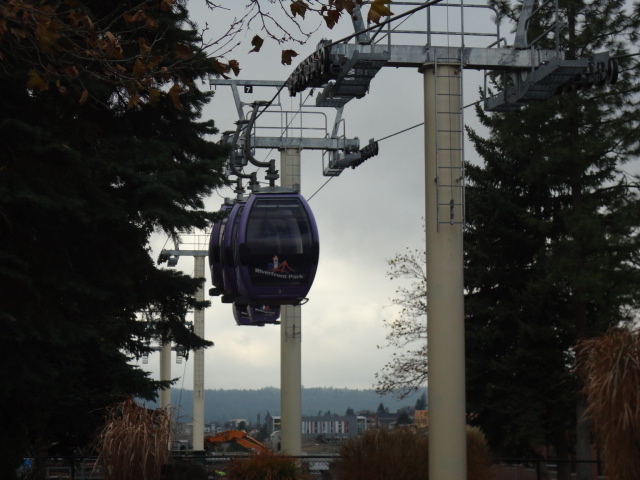 Unlike the chairlift over the fair, the Spokane Falls SkyRide comes in the form of a gondola to better protect visitors from the raging waters below. The ride takes visitors from its starting point on Havermale Island, over the falls, and under the Monroe Street Bridge into a world of mist. Many Spokane locals have taken this ride at least once. 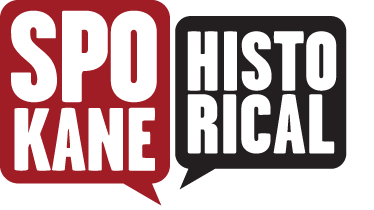 Sherman Alexie, a Spokane Indian author remembers riding the gondola with his father in one of his essays. He recalls, "My father told me to hang on... He was smiling as I struggled to keep my shoe." 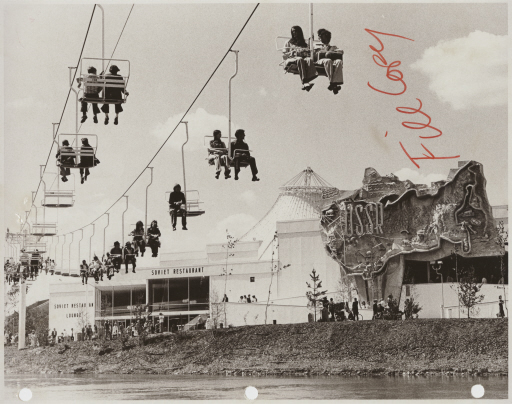 One goal of Expo 74 was to clean up the river and reclaim the beauty of the falls. There are now many views of the falls from several different vantage points in the downtown area. But the SkyRide is by far the most spectacular. In 2013 the SkyRide was named "One of the Top 12 Scenic Cable Rides in the World" by Conde Nast Traveler Daily Traveller. 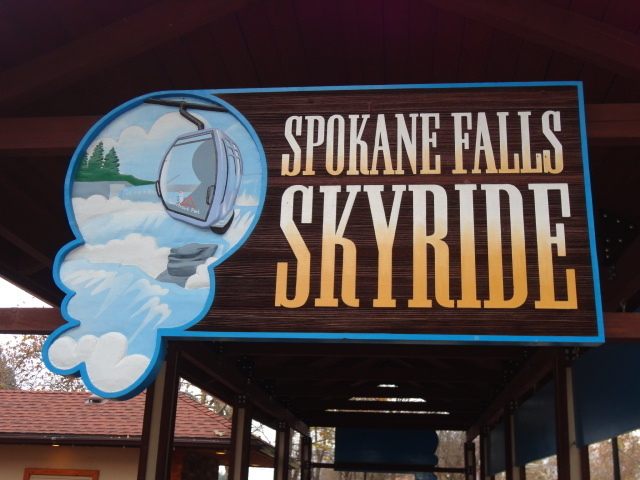 The SkyRide takes full advantage of the second longest urban falls in the United States, but written descriptions often fail to do it justice. The only way to fully appreciate this ride is to experience it for yourself. 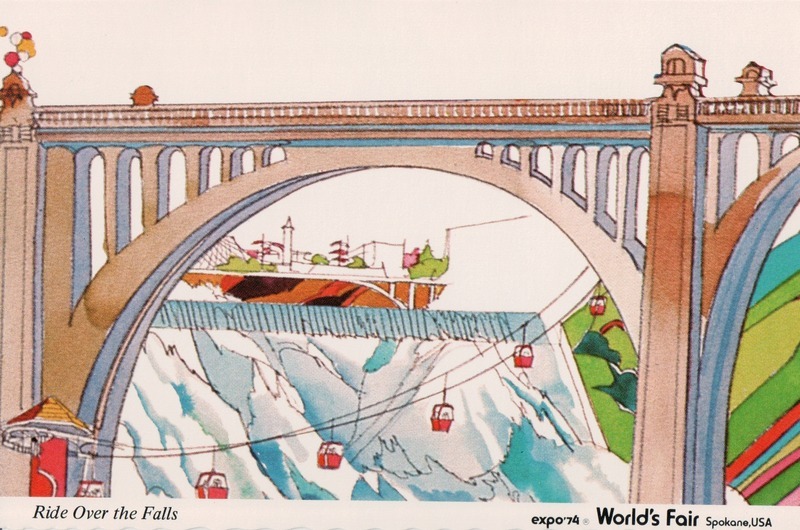 Cory Carpenter, “Spokane Falls SkyRide,” Spokane Historical, accessed April 24, 2019, https://spokanehistorical.org/items/show/381. SpokaneRiverfrontPark, "Spokane Falls SkyRide" accessed Novermber 12, 2013, http://spokaneriverfrontpark.com/index.php/RFP/page/360/. Youngs, J. William T. The Fair and the Falls: Transforming an American Environment (Eastern Washington University Press, 1996).